I want to remember that it usually happens this way: when I finally get to sit down and spin, I’m a goner. Forget the world and the laundry, I’m busy. I want to remember this, so that it won’t be so long before the next time. I spent a few hours on Sunday, and a few more today, spinning sock yarn and getting to know Mister Reeves. I love this wheel. I just adore it. It makes me happy right down to my toes. It is the Wheel of My Dreams, and thanks to my friend K, it lives with me. I reached a point today when I knew I needed to move to the next fastest whorl, and that’s when we clicked, the wheel and I. I’m making some nice yarn, though I still have a way to go before I’m completely satisfied. More practice is needed, and it doesn’t bother me to say that. I can do better, though I’m not going for Certificate-of-Excellence standards. My spinning on the Reeves lacks the certainty and control I have when I spin on my Sweet Ashford, and it’s due simply to the fact that I have been spinning on that wheel for many, many years. The Ashford is predictable, while the Reeves still holds a few surprises. The yarn is another delight. Teyani saw my wish when I posted this photograph, and she granted it in the form of a new Sock Hop colorway from Crown Mountain Farms called “Do You Wanna Dance.” What a treat! If you spin, and you haven’t tried her hand dyed superwash Merino roving, you’re missing an amazing experience. It’s not like any superwash Merino I’ve ever spun; it’s light, lofty and very soft. I’m thrilled to have inspired Teyani’s creativity, too. I’m not yet tired of the cold weather, but then I don’t have to spend much time in it. Yesterday I had on socks, a sweater, a scarf, and mitts — all my own handknits. Getting to wear my work, and knowing that I made these things that keep me warm is a very good feeling. And that I can spin the yarn to make the warm things — that’s the cherry on top of the ice-cream sundae. After the Sock Hop becomes sock yarn (I haven’t even filled one bobbin yet) I have some more luxurious fibers to work with. Which will I turn to — the Chasing Rainbows Cashmere/Tussah, or the Spirit Trail Baby Camel/Tussah? Life must be good, if these are the kinds of decisions I get to make. And if I keep spinning, I’ll surely remain grounded throughout Getting Ready for Inventory, Doing Inventory, and Cleaning Up After Inventory at the bookstore! Next Enough with the socks already? Oh, how wonderful about the roving from Teyani! !I know what you mean about wearing handknits – I find it deeply satisfied that I can make things to keep myself warm. I’m the same way when I spin. I tend to forget the world. Our weather probably isn’t as cold as yours but I feel the same way about it. It makes me feel good to be able to wear my handknits. ooo. Gorgeous. Beautiful. Even with my Ashford, I still feel there are things to discover. With the Golding I am still a mere acquaintance. But there is time. Lots of time ahead to get to know each other better.Stay warm now. Are you kidding me? This will be the most gorgeous sock yarn. Would love to see it knit up already! ;o)Must be so wonderful to be able to spin….. I keep saying that there are no people who don’t spin, there are just people who don’t spin YET.Your post is the perfect thing for not-yet-spinners to read to make them understand why it is so satisfying. oh! to be in the zone! 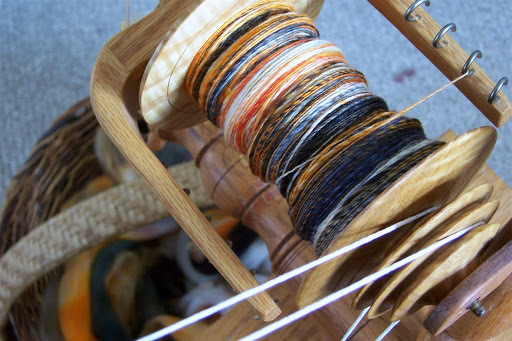 I will learn how to spin this year, if only to be able to use CM fibers! Spinning seems [to me anyway] to be a very peaceful and relaxing thing to do. But, I’ve never actually tried it, just watched it being demonstrated. I’d love to learn some day … weaving too.What a great feeling to be bundled up and kept cozy by things you’ve created with your own hands. So satisfying! When I grow up I want to spin and know the bliss you’ve been experiencing! Honestly I believe that if you didn’t spin, the world would unravel. So forget the laundry, etc. and keep up the delicious work!Love the close up of the wheel. Wow. I finally started spinning again last weekend after months away for strange, nonsensical reasons. Yay.